Oral history interviews relating to Brisbane rugby league. Voices from Brisbane rugby league: Oral histories from the 1950s to the 1970s (This period was later extended). The Tom Brock Scholarship provided me with resources to interview leading identities from Brisbane rugby league who were ‘household’ names in Brisbane from the 1950s to the 1970s. These included ten players, one referee and a radio commentator. The scholarship allowed me to transcribe these tapes which provide the basis for my book Voices from Brisbane rugby league. The book was launched in Brisbane in 2009 and has had two print-runs. It has sold over 1400 copies. The players interviewed were ‘Mick’ Crocker, Brian Davies, Norm Pope, Peter Gallagher, Fonda Metassa, Barry Muir, Lionel Morgan, Marty Scanlan, Peter Leis and Des Morris. The referee was Henry Albert and the radio commentator was George Lovejoy. 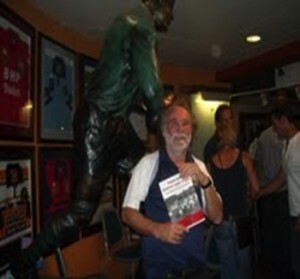 Sports History, Rugby League and Oral History conferences. The power point of these presentations follows. Working as a tutor in the Business School, University of Queensland. I have been a tutor and adjunct lecturer in the former School of Industrial Relations Griffith University and in the Business School at both Griffith University and the University of Queensland. My doctoral thesis examined aspects of trade unionism in Australia. My book, Uncharted Waters: Social Responsibility in Australian Unions, was published in 2005. From 2000 to 2011 I was Media Officer for the Queensland Secondary Schools Rugby League. In 2009 I was one of the speakers at the University of Huddersfield at a ‘Sports and Oral History’ Conference. I spoke on oral history and the Brisbane rugby league. Also in 2009 my book Voices from Brisbane rugby league: oral histories from the 50s to the 70s was published. This has sold nearly 1500 copies. I have also a chapter, in Football Fever: Moving the Goalposts, which discussed the history of rugby league in Brisbane.